Adolescent violence and abuse towards parents is increasingly recognised as a global problem. Inverting how we normally understand power to operate in abusive relationships, it involves actors who cannot easily be categorised as victims or perpetrators, and often impacts families who are experiencing multiple stressors and hardships and may be experiencing other forms of family abuse. This unique book draws on an international selection of contributors to identify, present and explore what we know about what works when supporting these families. Part 1 discusses some well-established intervention approaches and programmes, looking at their theoretical base and relevant assessment, delivery and evaluation issues. It provides readers with a theoretical framework and toolkit for use in their own intervention work. Part 2 presents examples of innovative practice, with an emphasis on diverse institutional settings, geographical locations and other important contexts that shape practice. It provides readers with an understanding of some of the complexities involved in this kind of intervention work, offering tools and strategies to be applied in their own work. 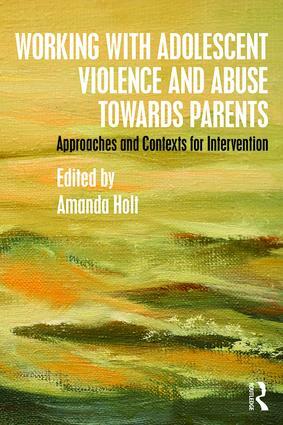 This interdisciplinary guide provides an essential resource for students and practitioners with an interest in domestic and family violence, youth studies, child protection, drug and alcohol work, and youth justice from a wide range of professional backgrounds. Amanda Holt, PhD, is Reader in Criminology at the University of Roehampton, London, UK. She works from an interdisciplinary perspective, drawing on ideas from psychology, sociology, social policy and social work. Her research interests primarily focus on families, identity and harm and she has published widely on the topic of adolescent violence and abuse towards parents, including the book Adolescent-to-Parent Abuse: Current Understandings in Research, Policy and Practice (2013). She has also published empirical and theoretical research on a number of other criminological topics including anti-violence strategies in schools, parenting and youth justice, and qualitative methodologies.